Now I create a solid color layer and copy-paste the gradient as its layer mask. Where the mask is white I got 100% opacity and where the mask is black I got 0% opacity, with a fading in between. At this point I duplicate the solid color layer and invert the mask of the new layer (Colors → Invert in GIMP). What I expect is that the opacity of the new layer should be complementary to the first one, so having the two layers stacked one on top of the other should result in a solid color. Why is this happening and how to get what I want instead? This is expected, opacity is not additive, it is more like multiplicative. Not the answer you're looking for? Browse other questions tagged gimp mask or ask your own question. Gimp: Add text to Layer Mask? 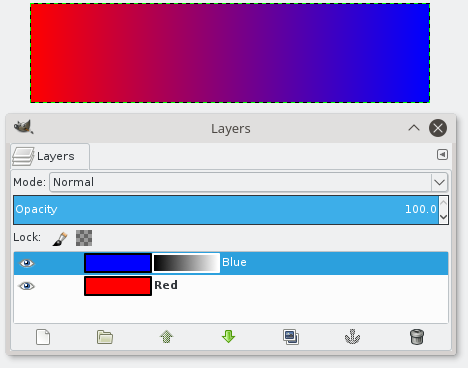 How to mask a layer from a channel in GIMP with Python? how do I make a custom gradient shape mask or vector mask that is gradually transparent on one side only?